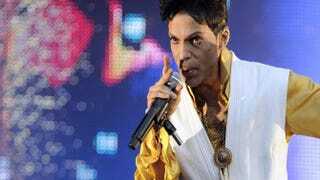 Prince (born Prince Rogers Nelson) was hospitalized on Friday after his private jet made an emergency landing in Illinois. TMZ was the first to report that Prince’s private jet made an unscheduled landing at Quad City Airport in Moline, Ill., a little after 1 a.m. Initial reports had fans and admirers scared that something serious happened to the beloved musician, but a rep was able to confirm that the star had been battling the flu for a few weeks, and that he was released from the hospital about three hours after arriving. Prince was reportedly flying home when he got ill after performing for two nights in Atlanta for his intimate “Piano & A Microphone” tour. The rep says that these two shows were postponed from a week earlier due to the same flu, but the singer insisted on doing the shows although he was not 100 percent well. We hope the purple one is on the mend!